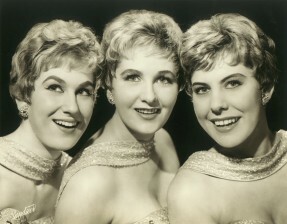 Riss Chantelle formed the LANA SISTERS with Lynne Abrams and gave Dusty Springfield her first professional engagement with the trio. They signed with Fontana Records and recorded "Chimes of Arcady" & "Ring-A-My-Phone" and with their jazzy pop style, they soon made their name in live shows and TV appearances. The girls were managed by Evelyn Taylor from the office of Joe Collins, father of Joan & Jackie, who managed Adam Faith & Sandie Shaw. 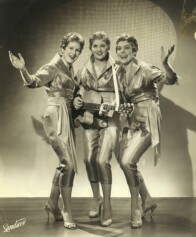 One of the Lana Sisters' first bookings was on "6 5 Special" the first BBC Light Entertainment pop programme, together with Joe Brown & The Bruvvers, Don Lang & His Frantic Five and all the chart toppers of the day. They also appeared on the BBC's "Drumbeat" alongside Adam Faith and John Barry, and took part in a TV Christmas "Tommy Steele Spectacular" singing "Seven Little Girls Sitting In The Back Seat" with Al Saxon. The girls toured Ireland, performed at many charity shows and appeared with Nat King Cole on his London dates. They appeared twice at the Royal Albert Hall Festival of Popular Music (Big Beat) and Saturday Club, and they broadcast and toured with Cliff Richard, Tommy Steele, Adam Faith, John Barry, Guy Mitchell, Mike & Bernie Winters and Morecambe & Wise. Dusty Springfield went on to join the Springfields and Riss formed The Chantelles.